Choose one player to act as the "banker". The banker gives each player (including himself) 50 Gold. The banker keeps the rest of the Gold close at hand so he can make change during the game. The banker must not mix his own money with the bank's funds. For your first couple of games, you may wish to play the basic game. The basic game is played without the Royal Goods cards. Remove the twelve Royal Goods cards from the deck and return them to the box. Then, shuffle the rest of the Goods cards together, and deal six cards to each player face down. Place the rest of the cards in a face down draw pile. Turn over five cards from the draw pile to form a discard pile. Turn over another five cards from the draw pile to form a second discard pile. Yes, there are two discard piles! All players can examine the cards in both discard piles at any time. Finally, the player with the highest value of actual cash on their person will be the first Sheriff. Give that player the Sheriff marker. If there is a tie (or if no one has any money), then randomly choose the Sheriff. Note that the player who is acting as the Sheriff only participates in Phase 4, Inspection, and Phase 5, End of Round. He would do well to observe the actions of the other players during the other phases. At the end of each round, players will pass the Sheriff Marker to the left allowing a new player to become Sheriff. 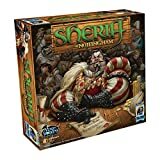 The game continues until each player has been the Sheriff twice (three times in a three-player game). In this phase, you may discard unwanted cards and draw new ones, hoping to get a set of goods to take to market. 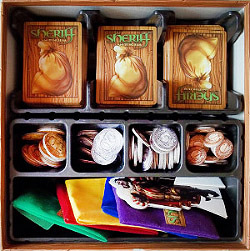 Starting with the player to the Sheriff 's left and going clockwise, each merchant player takes one turn. On your turn, you may set aside up to five cards from your hand (face down), then draw back up to six cards. When you draw cards, you can take them from the top of either discard pile or the draw pile. Yes, this means that if you really want the third card down in a discard pile, you have to draw the two on top of it first. You must always draw the cards you want from the discard piles before drawing any cards from the draw pile. You cannot take some cards from the draw pile, and then decide to take cards from the discard piles. After you have drawn cards, place the cards you set aside at the beginning of this phase on one of the discard piles, face up, in any order you choose. 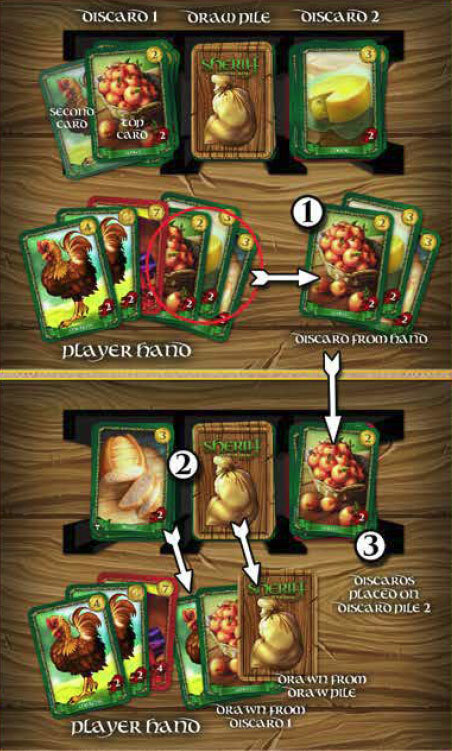 Example: Little John has two Chickens in his hand, and he knows that there is another Chicken two cards down in the left discard pile. He discards three cards from his hand, draws those two cards from the discard pile, and draws one from the draw pile. Then he places his three discards on top of the right-hand discard pile. 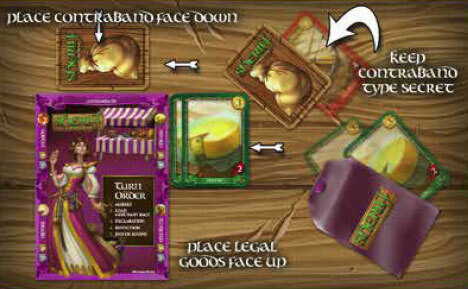 In this phase, you place the goods cards that you want to take to market in your Merchant Bag. All merchant players place Goods in their bags at the same time. You can place from one to five Goods in your Merchant Bag. You cannot place zero Goods or more than five Goods in your bag. 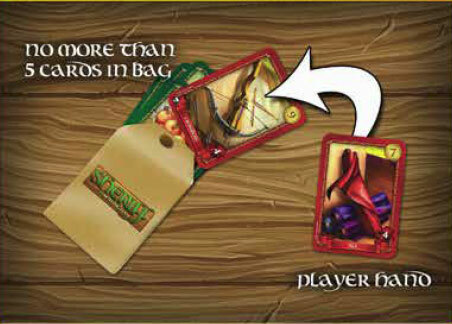 Be careful that you don't let the Sheriff or the other merchants see which cards you put in your bag. When you are satisfied with the Goods in your bag, snap it closed and place it on the table in front of you. Once you close your bag, you cannot change your mind later. Example: Alan-a-Dale has been collecting Apples. He places four Apple cards from his hand into his Merchant Bag. Then he adds a Crossbow. He would love to toss in the Silk he's holding, but he can only put a maximum of five cards in his bag. He closes the bag and places it in front of him. In this phase, you must declare to the Sheriff what goods you are delivering to the market. Of course, you can feel free to lie to him. In fact, you will probably have to lie at some point during the game! 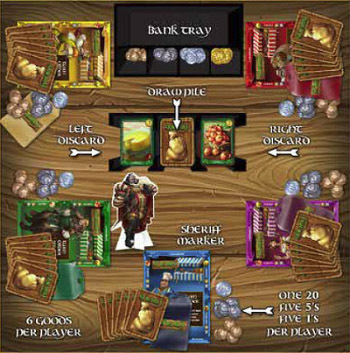 Starting with the player to the Sheriff 's left and going clockwise, each merchant player looks the Sheriff in the eyes and tells him what Goods he is taking to market. When you make your declaration, you must hand your Merchant Bag to the Sheriff. Important: The Sheriff cannot look in the Merchant Bags at this time. You can only declare Legal Goods. You can only declare one kind of Goods. You must declare only the exact number of cards in your Merchant Bag. 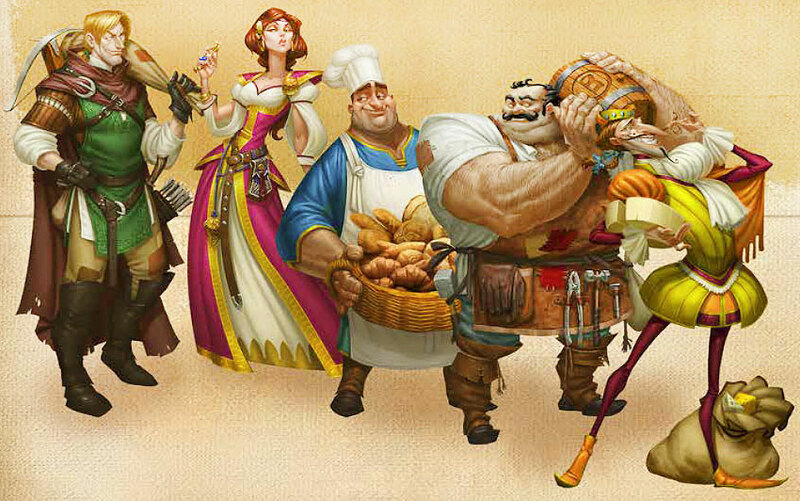 Example: Will Scarlet looks at the Sheriff and announces: "My bag has four Chickens in it!" He has to say four, because there are four cards in his Merchant Bag, but they might not all be Chickens! In fact, Will only has two Chickens in his bag. The other two cards are a Cheese and a Silk. The Silk is contraband, so he would have to lie about that anyway: Will can only declare Legal Goods. Will cannot declare three or five Goods, because he must always declare the exact number of cards in his bag. He could not declare that he has two Chickens and two Cheese, because he can only declare one type of Good. Now the Sheriff can choose to inspect the Merchant Bags. When you are the Sheriff, you decide the order in which you inspect the bags. You can inspect any number of Merchant Bags during this phase. You can even decide not to inspect any bags. You cannot offer any of the cards in your hand as part of a bribe. Once the Sheriff has made a choice it cannot be changed. As soon as you unsnap a Merchant Bag or hand it back, it's too late to change your mind! After the Sheriff hears your offer (and after any negotiation required to settle the issue), the Sheriff must either allow you to pass (accepting any bribe that may have been offered), and hand you your Merchant Bag, or inspect the bag (refusing any bribe that may have been offered). 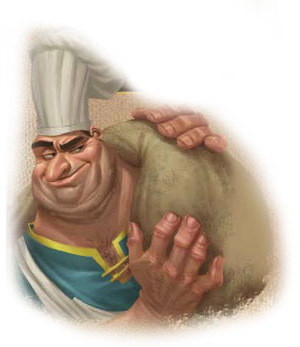 Example: The Sheriff is about to inspect Friar Tuck's bag. Tuck says "Wait, Sheriff! You don't need to look in that bag! How about I give you five Gold and two Apples for your trouble?" 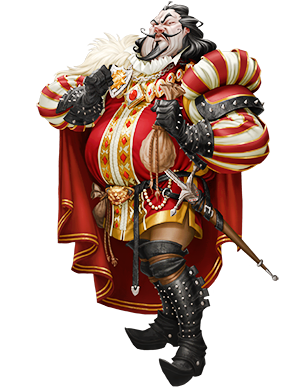 The Sheriff looks at the good friar suspiciously and says, "Make it eight Gold and we have a deal". Looking hurt that no one believes his innocence, Tuck pays the Sheriff eight coins and two Apple cards from his Merchant Stand. The Sheriff hands Tuck's Merchant bag back to him. You must now show the cards in your bag to the other players. All Legal Goods are placed in the matching spaces of your Merchant Stand face up. The Legal Goods of your Merchant Stand can always be inspected by any player at any time. All Contraband is kept secret! 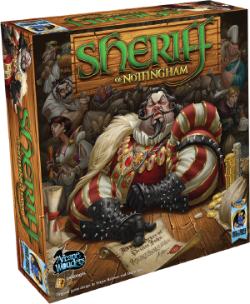 You must reveal the number of Contraband cards you have smuggled into Nottingham, but not their type. Keep your Contraband face down at the top of your Merchant Stand. If you were telling the truth, and your bag has exactly what you declared, the Sheriff must pay you Gold equal to the Penalty on every Legal Good in your bag. Your Legal Goods are then added to your Merchant Stand, as above. Any Goods that you did declare truthfully are allowed into the market. Place them on your Merchant Stand face up, as normal. Any Goods that you did not truthfully declare are confiscated! The Sheriff takes all of those Goods and places them on one of the discard piles, in any order he chooses. You must pay a fine to the Sheriff for all confiscated Goods. The fine is equal to the Penalty shown at the bottom of each card. Example: Maid Marion's sweet and innocent reputation got her past the Sheriff without even paying a bribe! She pulls three cards out of her bag: Two of them were Cheese, just like she said in the Declaration Phase. She places those in her Merchant Stand face up. But the third card was Contraband! The Sheriff groans as she places it face down above her stand. Promises of future favors, which take place after the current inspection phase, are not binding. 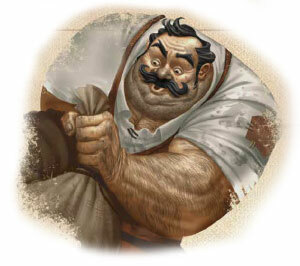 A merchant might offer the sheriff a bribe, which includes Goods in his merchant bag. Of course, he might be lying about the contents of his bag. If he is allowed to pass, when he reveals the Goods in his bag, he need only pay the sheriff the Goods he promised which actually exist! If he promised Goods to the sheriff, which are not in his bag, he does not have to pay those. Example: The Sheriff is threatening to inspect Richard at the Lee's Merchant Bag. Richard decides to use this opportunity to get back at Sir Guy of Gisbourne. He makes the following offer: "Sheriff, I will pay you twenty Gold if you agree to let me pass unchecked and agree to inspect Sir Guy's bag, regardless of what bribes he may offer you!" The Sheriff agrees, taking Richard's money and waving him along. Now the Sheriff must inspect Sir Guy's bag, since the deal can be completed in the same round. In a later round, Sir Guy makes a deal with the Sheriff: "If you don't inspect my bag this round, I won't inspect your bag next time I'm Sheriff". The Sheriff agrees and lets Guy into the market. But, when Guy is the Sheriff during a later round, he could decide to betray his honor and inspect the (former) Sheriff 's bag. If all players have been Sheriff twice (three times in a three-player game), the game ends immediately! Otherwise, the player who was the Sheriff passes the Sheriff marker to the player on his left. That player will be the Sheriff during the next round. All players draw cards until they again have six cards in hand. Note that the Sheriff should have six cards in hand from the last round. The next round begins with Phase 1, the Market Phase. It is possible that you will run out of Gold coins during the game. 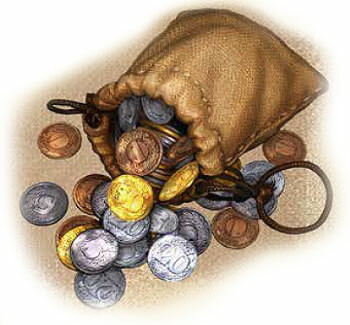 You cannot offer Gold for bribes if you do not have the coins to pay. If you cannot pay a Penalty you owe, you must give the player Legal Goods from your Merchant Stand with a value at least equal to the amount you owe. (This may mean you give more value than you owe, but you won't receive change for the excess). If you do not have enough Legal Goods, you must reveal and hand over Contraband to make up the difference. The player who received the Goods may then add them to their Market Stand. If you have exhausted all the Goods and contraband in your Market Stand to pay a debt, any leftover debt is considered paid. this helps a desperately poor player. In the event that you run out of cards during the game, you will need to shuffle all but the top five cards from each of the two discard piles to recreate the draw pile. 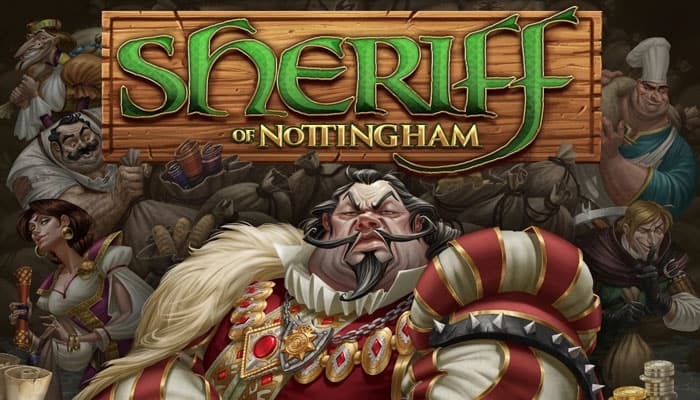 The game ends after all players have had two chances (three chances in a three-player game) to play as the Sheriff. At the end of the last round, all players discard any cards they have in hand-those cards are not worth any points. The value of all Goods you have in your Merchant Stand (Legal and Contraband). Any bonuses you have earned for being the "King" or "Queen" of a type of Good. If two players tie for the same amount of points, the player with the most Legal Goods wins. If there is still a tie, then the player with the most Contraband Goods wins. If there is a tie for the King's Bonus, add the King and Queen bonuses together, and divide the total equally between all the tied players (rounding down). Do not pay out bonuses for second place. If there is a tie for the Queen's Bonus, divide those points equally between the tied players (round down).